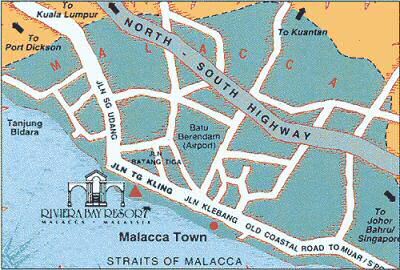 Complete info with pictures about all the beaches in and around Malacca. 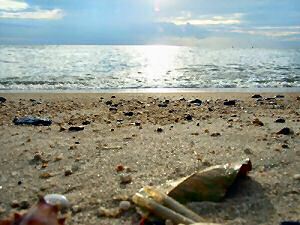 Although Malacca town is not famous for beach tourism, do enjoy 5 marvelous beaches at less than 30 kilometers away from Malacca. 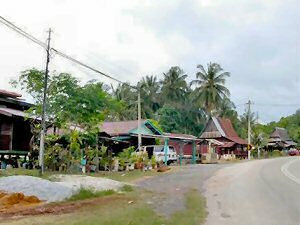 See Pulau Besar map above: drive from Malacca to the Anjung Batu secure parking and take the 20 minutes ferry to Pulau Besar. You could stay at the Putera Island Resort when you fancy a nasi lemak (delicious Malaysian coconut rice) brought to your chalet’s doorstep on a lazy afternoon. Pulau Besar comprises 168 hectares of tranquil island with un-spoilt beauty. It’s an ideal place for relaxing and we had our first diving lesson here, straight in the ocean. After that a lovely dive of maybe 10 to 20 meters to see lots of corals and colourful fishes. You can also go snorkeling to admire corals and fishes, but diving to the corals was more spectacular. 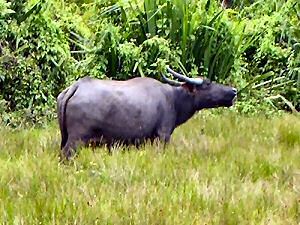 For the sport enthusiast, Pulau Besar is an ideal starting point for jungle trekking, island hopping like we did, doing an island tour, go canoeing, or just stroll out on the beach. The tiny island Pulau Upeh is a turtle sanctuary and one of the few sites in the west coast of Malaysia that has regular turtle sightings. The egg-laying season is from March to June when visitors can come to catch a glimpse of Hawksbills coming on the beach to nest. We recommend to follow a guided tour organized by the island’s resort. 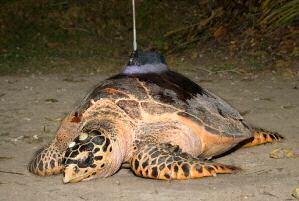 The Hawksbill turtle is a medium-sized marine turtle with a hawk-like beak and a thorny shell. Brown and lightly striped, these turtles find their ideal resting ground on Pulau Upeh. 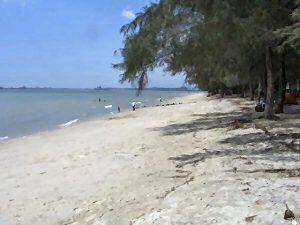 Tanjung Keling is the nearest beach from Malacca town, about 10 kilometers away. 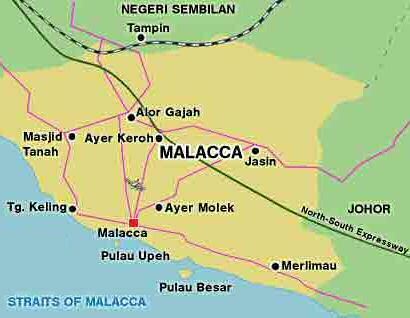 It’s one of the more recent developments of the Malacca tourism industry. 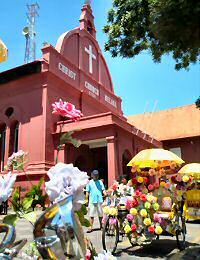 Take the Patt Hup bus from the Jalan Tun Ali bus terminal in Malacca town to reach the beach. 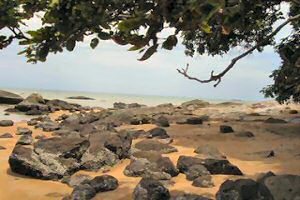 Tanjung Keling has a pleasant stretch of white sandy beaches lined with coconut palms and sea shells: perfect for a quick jaunt.. Try one of the many grilled fish stalls along the beach offering fresh sea food. North of the beach is the Tanjong Keling Mosque, with its unique octagonal minaret and tiled steps. grave of Hang Tuah, the legendary Malay warrior. Pantai Kundur is about 2 km further down Tanjung Keling. 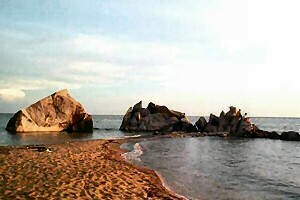 It has a nice beach with a good stretch of white sand: ideal for swimming and picnicking. When swimming do ask the locals when the jellyfish season is. Make sure to visit Pantai Kundur beach in the evening or stay overnight. 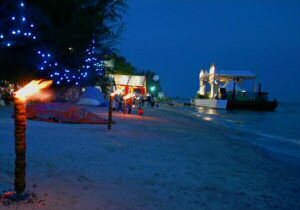 Being a small fishing village, Pantai Kundur is best known for its graceful form of night-fishing. Fishermen suspend their nets from poles near their kelongs – houses built on stilts over the water – and periodically lower them to net a passing shoal of fishes. Dinner at the beach is always a recommendation when you visit Malaysia! 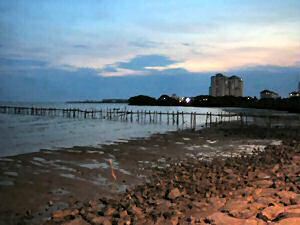 Tanjung Bidara is one of Malacca’s popular beach resorts at 35 km north of Malacca town. To reach there from Malacca town: catch a taxi or hop on the Patt Hup bus en route to Tanjung Bidara at the Jalan Tun Ali Terminal. Being one of the Malacca state’s more popular beaches, this white sandy beach is shaded by swaying trees for cozy picnics. The cove is perfectly suited for swimming. 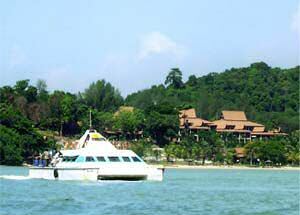 The Tanjung Bidara Resort offers facilities for canoeing, water-skiing and jet-skiing. Although this serene beach is the furthest away from Malacca town, it’s well worth already for the scenic journey through Malacca’s countryside of deserted padi fields and Malay villages. If you love island hopping, visit the beaches of the Islands Pulau Besar and Pulau Upeh. For turtle watching visit the latter from March to June. If you want to stay on land, take a taxi or the Patt Hup bus at the Jalan Tun Ali Terminal in Malacca town to reach the most serene beach of Tanjung Bidara or the closer by beaches of Tanjung Keling or fishing village Pantai Kundur.